The weather has become chilly, making it the perfect time to grab a quick organic coffee or a leisurely coffee with interactive conversation and sharing of information with other citizens who are concerned about Monsanto’s proposed plans in our community. 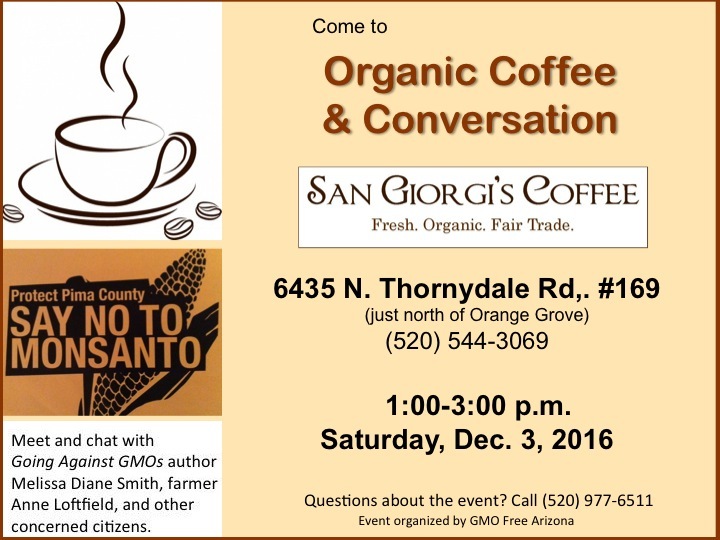 This Organic Coffee & Conversation event will take place at San Giorgi’s Coffee, 6435 N. Thornydale Road, this Saturday, December 3, between 1 and 3 p.m. San Giorgi’s is an independent family owned coffee shop in northwest Tucson that not only offers organic and fair trade coffee and tea but also organic milk, coconut milk, or almond milk to add to your drinks. A Call to Action for December for Pima County/AZ Citizens and Visitors! 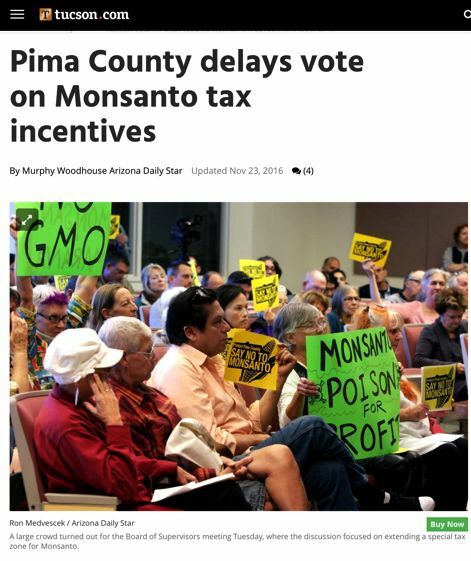 The Community Pushes Pima County to Delay a Vote on Monsanto Tax Incentives; What’s Coming Next? The people of Pima County emphatically told the Pima County Board of Supervisors at its board meeting on November 22 that they do not want multinational chemical corporation Monsanto in the Tucson area. A few hundred people attended the meeting, and many held yellow signs that read “Say NO to Monsanto.” There were more than three hours of statements from more than 50 speakers, and virtually everyone who spoke opposed Monsanto’s plans to build a facility in Avra Valley. The eclectic tidal wave of opposition persuaded the board to delay its vote on a tax incentive for Monsanto. At the meeting, a few children spoke out against the corporation. One woman described Monsanto as a Trojan horse, trying to give gifts now so Pima County would bring in the corporation and then Monsanto would destroy our community from within. Ida Drucilla “Dru” Heaton wore a lei in honor of her Hawaiian heritage and what the Hawaiian people have experienced at the hands of Monsanto. The collective arguments against Monsanto melded beautifully together and pushed the board away from greenlighting a tax break for Monsanto. Instead, the board unanimously agreed to delay the vote until its meeting on February 21, 2017. The board also agreed that five open public meetings—one in each district—will take place about Monsanto and its proposed plans before that date. Planning on going to the Pima County Board of Supervisors meeting at 130 W. Congress Avenue at 9 a.m. tomorrow, Tuesday, November 22nd, to tell the board in no uncertain terms that to vote NO on the proposal to give Monsanto a tax break? We’re counting on you! Please join us as we fight against this outrageous idea! In a guest opinion piece in the November 15th Ârizona Daily Star, Supervisor Richard Elias outlined a long list of reasons why the Board of Supervisors should not support a tax break for Monsanto. “Monsanto has a decades-long litany of producing, promoting, and distributing some of the deadliest toxins ever created—and shirking responsibility for the tragic consequences of their use,” Elias wrote. The company and its predecessors have had a hand in, often been a creator of, many of the world’s worst toxic nightmares: PCBs (polychlorinated biphenyls), early nuclear weaponry, DDT, dioxin, Agent Orange, Roundup (glyphosate), Lasso (alachlor), Bovine Growth Hormone, and genetically modified organisms (GMOs). Elias described the toxicity of—in other words, the environmental and health harm brought by—each one of these products. Below is a letter that Dr. DeeAnn Saber wrote to John Moffat of Pima County Economic Development regarding Monsanto’s purchase of land in Pima County and its proposed plans to build a facility here. She wanted the letter to be shared with the public. I have attempted to call numerous times but apparently no one is willing or able to answer your phones. I am writing therefore in regards to the decision the Board has made to let Monsanto into our area. They were just on trial at The Hague, an internationally recognized institution, for crimes against humanity due to the poisonous nature of their products. Upset about chemical corporation Monsanto’s plans to build a facility in Pima County and wondering what you can do about it? 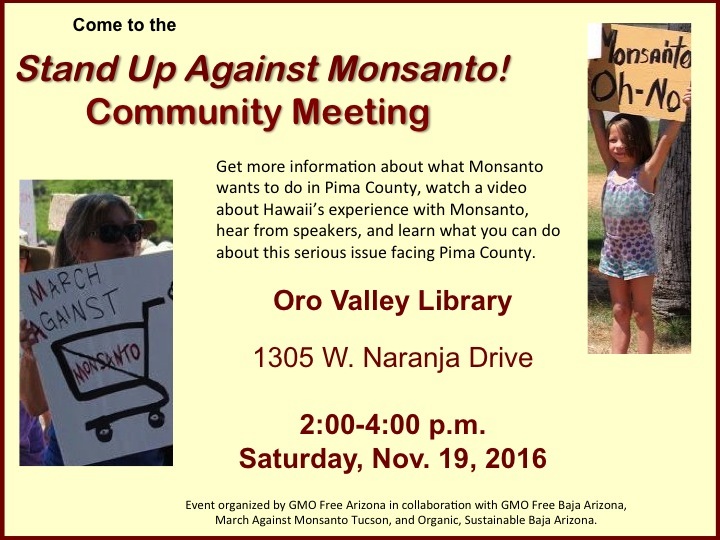 Be sure to attend the Stand Up Against Monsanto community meeting at the Oro Valley Public Library, 1305 W. Naranja Drive, at 2 p.m. on Saturday, November 19, 2016. See the Facebook event page. Get information about the Pima County Board of Supervisors meeting on Tuesday, November 22nd, at 9 a.m.; why it’s so important to have a large community turnout there; and what to expect at the meeting. Edible Baja Arizona magazine posted this strong statement against the proposed Monsanto development in Pima County. View the original post of this article on its website. A proposed Monsanto greenhouse in Marana would undermine and threaten Tucson’s designation as a UNESCO City of Gastronomy. In early October, biotech seed company Monsanto purchased 155 acres in Avra Valley northwest of Tucson for $3.74 million. According to reporting by Tony Davis in the Arizona Daily Star, Monsanto intends to install a seven-acre greenhouse on the site to grow and test corn and soybean seed. Without public input, Pima County’s Economic Development office offered Monsanto access to the financial advantages that come with being part of Tucson’s foreign trade zone. Davis has reported that this is essentially a tax incentive package for Monsanto, which could possibly reduce the company’s property tax burden by two-thirds. Edible Baja Arizona joins many community organizations, farmers, and local food advocates in voicing our strong opposition to Monsanto’s presence in Pima County. We request that that the County convene a citizen’s taskforce of farmers, local food economists, crop breeders, weed scientists, and ethicists to fully review and critique Monsanto’s plans on behalf of the Board of Supervisors. We also oppose its inclusion in the Foreign Trade Zone as a surreptitious tax incentive, and call on all Pima County Supervisors to vote no when it comes to a vote on November 22.